There’s a new year nip in the air so you’re gonna need your warmest coat! But there’s loads on as ever. Here’s our favourites. 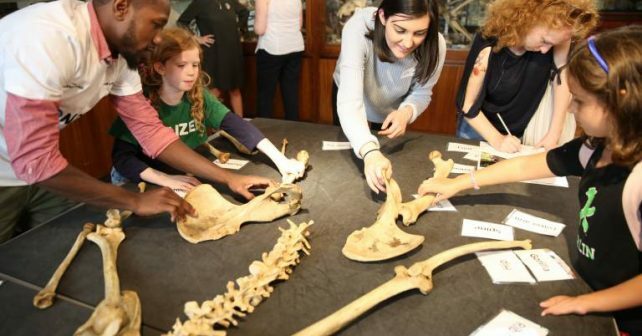 Unleash your little one’s inner Attenborough with a FREE afternoon up close with animal bones and ancient fossils at Grant Museum of Zoology. Explore Zoology features shark teeth and whale bones among other natural wonders that you can hold and touch. Staff will be on hand to answer your questions too! How about a weekend of alternative sounds and wondrous music from across the globe at Southbank. SoundState explores experimental melodies, tunes and music making from Iran, Pakistan, Sweden and elsewhere. FREE events include exploring the sound of table tennis at Bounce Beat: Ping-Pong & Music Workshop on Saturday plus Play for Progress (pictured above) – a performance from teen refugees – on Sunday. And staying on the Southbank, how about an afternoon looking back on the life of Disney’s favourite fictional big laughing red-head? Woody Woodpecker: A Celebration at BFI features a light-hearted panel discussion looking back on some of his star turns plus a sneak peak at some unreleased material from a new film starring Woody. That’s all folks! Show up and exchange up to ten pre-loved pieces of clobber you no longer wear. The motto is “bring the quality you expect to find”. Can’t argue with that! Get a half price main at Pizza Pilgrims… provided you can prove you’ve walked 10,000 steps that day!